Well actually to me and my darling hubby Peter. We got married 18 years ago today! I decided to have a little play with my Copics on this one - creating the fur on the bears with dots and dashes - more time consuming than it first appeared, but you know what I am actually rather chuffed with how they turned out. Good old glitter glue and a pre-embossed pearlised card added a little sparkle. Happy Anniversary, Jane!! 18 years is a big accomplishment these days and well worth celebrating! Absolutely gorgeous....love those bears. Can you tell me s it a stamp? Just stunning! I love the white contrast against your always gorgeous colouring! Happy Anniversary! Enjoy your day! Congratulations and have a wonderful anniversary! Adorable card. Thanks guys - I can hardly believe it's been 18 years, the time has flown by! Gorgeous card and HAPPY ANNIVERSARY!!! This is so gorgeous Jane!! Love the cute little teddy image :) Congrats on 18 years - that is amazing!! Happy Anniversary!!! Lovely card and the little bears are just presious. Belated Anniversary to you both. 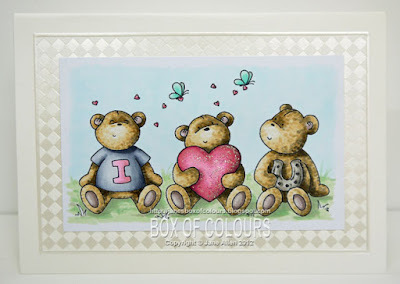 Love the dotty Teddy Bears..it's a great effect. Where is the stamp from Jane?